You could call it "Hall’s theorem": high-accuracy, 3-axis Hall effectA popular magnetometer technology, using a semiconductor plate. One injects current on one axis of the plate and measures a... measurement requires high-quality, 3-axis calibrationDuring calibration, the instrument reading is compared to one or more references to verify its accuracy. The references themselves need.... For Metrolab, this has led to several man-years of software development, megabytes of traceable measurements and a few challenging geometric puzzles. For those of you fortunate to own a THM1176, find out what Metrolab does for you without your knowing. Simple, fast, practical... Hall effect measurements have so many advantages that it is quite easy to “forget” a simple detail: a good Hall probe is first and foremost well calibrated – that is to say corrected for the physical effects that disturb the measurements. And with the THM1176 – the world's most compact 3-axis Hall magnetometer, capable of simultaneously measuring all three axes of a field ranging from a few µT to 20 T – calibration has become something of an obsession. "For each new probeThe actual sensor that is placed in the magnetic field. The NMR probe contains the NMR sample; the Hall probe... model – HF for high fields, HFC compact version, LF for low fields – most of our R&D effort was channelled into the calibrationDuring calibration, the instrument reading is compared to one or more references to verify its accuracy. The references themselves need... process", confirms Metrolab’s Philip Keller. Take the standardA standard is the internationally agreed-upon physical representation of a unit. For example, a caesium clock is the standard for... HF probeThe actual sensor that is placed in the magnetic field. The NMR probe contains the NMR sample; the Hall probe.... Put it in a zero GaussThe cgs unit of magnetic flux density. Officially declared to be outdated, it is still popular for low fields. Equal... chamber to correct the offset, then run a series of measurements checked by an NMRNuclear Magnetic Resonance. A resonance phenomenon seen when you irradiate a sample in a magnetic field with an RF field.... probeThe actual sensor that is placed in the magnetic field. The NMR probe contains the NMR sample; the Hall probe... in a reference electromagnetA magnet driven by an electrical current, as opposed to a permanent magnet.... – Metrolab’s goes up to 1.6 T – to cover the entire rangeThe range of a probe is defined by the minimum and maximum field strength it can measure. On an instrument,... of fields along the x-axis. Then turn the probeThe actual sensor that is placed in the magnetic field. The NMR probe contains the NMR sample; the Hall probe... in the jigIn our context, refers to a mechanical structure that allows a probe to be placed in known locations in the... and do the same along the y and then z axes: you will have enough measurements to correct the offset, gain and nonlinearity. Now heat the jigIn our context, refers to a mechanical structure that allows a probe to be placed in known locations in the..., wait for the measurement to stabilise and repeat the whole process to correct for temperature variations. Well done. You’re one-third of the way through. Once the data have been acquired, the software takes over, calculating the necessary adjustments and sending them back to the probeThe actual sensor that is placed in the magnetic field. The NMR probe contains the NMR sample; the Hall probe.... You can now repeat all the measurements for the crucial test phase! 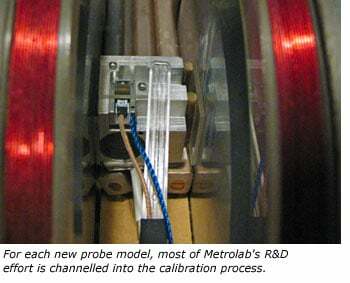 “The process is fine-tuned now, and for a batch of 20 probes it takes about a week to complete,” says Metrolab’s calibrationDuring calibration, the instrument reading is compared to one or more references to verify its accuracy. The references themselves need... specialist Jacques Tinembart. During which time you will have paid a short visit to a private clinic in Geneva, not for a checkup but because calibrating HF probes requires 3 T measurements – in other words, a superconducting MRI magnet. All these measurements, traceable for each probeThe actual sensor that is placed in the magnetic field. The NMR probe contains the NMR sample; the Hall probe..., represent several megabytes of data. Developing these acquisition and calculation programs for each type of probeThe actual sensor that is placed in the magnetic field. The NMR probe contains the NMR sample; the Hall probe... is of course a key factor in Metrolab’s success. But the challenge is also mechanical: designing the positioning jigs is of critical importance and keeps the brain cells busy. As for the development of the LF probeThe actual sensor that is placed in the magnetic field. The NMR probe contains the NMR sample; the Hall probe..., it forced the team to explore new avenues. No NMRNuclear Magnetic Resonance. A resonance phenomenon seen when you irradiate a sample in a magnetic field with an RF field.... measurements here, currently out of the question with low fields; instead, calibrationDuring calibration, the instrument reading is compared to one or more references to verify its accuracy. The references themselves need... with an AC fieldA magnetic field that varies in time, as opposed to a DC field...., using as a reference a calibrated coil and voltage integratorThe part of a fluxmeter that integrates the voltage.... Using a 20 Hz alternating current allows the entire measurement rangeThe range of a probe is defined by the minimum and maximum field strength it can measure. On an instrument,... to be covered in 50 ms! However, developing the entirely new software proved to be particularly difficult. Anyway, your Hall probes are now properly calibrated. But you are not out of the woods yet. To ensure their long-term accuracy, the probes have to be calibrated regularly! The offset should be checked before each serious measurement, just as you would adjust a pair of scales. "A zero Gauss chamber is supplied with each Metrolab probe for this purpose", recalls Philip Keller. And the entire calibrationDuring calibration, the instrument reading is compared to one or more references to verify its accuracy. The references themselves need... process needs to be repeated to counter the other physical effects: "Each client is free to establish his own schedule, based on his needs, but we recommend an 18-month calibrationDuring calibration, the instrument reading is compared to one or more references to verify its accuracy. The references themselves need... interval." Of course, Metrolab provides this service on demand. To optimise its cost, four calibration "slots" per year have been allocated – the dates are in the product manual. And tomorrow, ±0.1% accuracyAccuracy is how close a measure conforms to reality. Even if our NMR Teslameter displays 9 digits, we claim 5...? Looking ahead, Metrolab’s immediate goal is to be able to calibrate HF probes beyond 3 T – which would extend their optimum working range correspondingly. "To do this, we are working on a jigIn our context, refers to a mechanical structure that allows a probe to be placed in known locations in the... adapted to measurements in small-bore, superconducting high-field magnets", indicates Philip Keller. But Metrolab's next big challenge is achieving ±0.1% accuracyAccuracy is how close a measure conforms to reality. Even if our NMR Teslameter displays 9 digits, we claim 5... with a 3-axis Hallteslameter. That will require a new sensor and electronics with a correspondingly lower noise floor... and very demanding calibrationDuring calibration, the instrument reading is compared to one or more references to verify its accuracy. The references themselves need... work. "The measurements have to be taken, not just along the principal axes (X, Y, Z), but at many angles covering the entire sphere", explains Philip Keller. This allows angle-dependent errors (see diagram) to be corrected by a deconvolution process, even those that introduce crosstalk amongst the three axes, such as the Planar Hall Effect. "In addition, to correct for temperature nonlinearities, we need to measure not just at two temperatures, but at many temperatures covering the operational rangeThe range of a probe is defined by the minimum and maximum field strength it can measure. On an instrument,...." The problem has been solved by CERN physicist Felix Bergsma, who has developed a device with which he has calibrated many hundreds of 3-axis Hall probes for CERN's ATLAS experiment. Metrolab's goal is to bring similar technology to the market in a fully industrialized instrument. That would represent a major step forward... and cover many research applications!